Ambassador Morgenthau’s Story is one of the most insightful and compelling accounts of what became a recurring horror during the 20th century: ethnic cleansing and genocide. 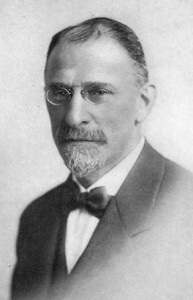 While he served as the U.S. ambassador to the Ottoman Empire under Woodrow Wilson from 1913 to 1916, Henry Morgenthau witnessed the rise of a new nationalism in Turkey, one that declared “Turkey for the Turks.” He grew alarmed as he received reports from missionaries and consuls in the interior of Turkey that described deportation and massacre of the Armenians. The ambassador beseeched the U.S. government to intervene, but it refrained, leaving Morgenthau without official leverage. His recourse was to appeal personally to the consciences of Ottoman rulers and their German allies; when that failed, he drew international media attention to the genocide and spearheaded private relief efforts. “The Central Government now announced its intention of gathering the two million or more Armenians living in the several sections of the empire and transporting them to this desolate and inhospitable region [the Syrian desert]… The real purpose of the deportation was robbery and destruction; it really represented a new method of massacre. When the Turkish authorities gave the orders for these deportations, they were merely giving the death warrant to a whole race they understood this well, and, in their conversations with me, they made no particular attempt to conceal the fact. Scarcely had the former possessors left the village, when Mohammedan mohadjirs – immigrants from other parts of Turkey – would be moved into the Armenian quarters. Similarly all their valuables… [were] then parceled out among the Turks. Before the caravans were started, it became the regular practice to separate the young men from the families, tie them together in groups of four, lead them to the outskirts, and shoot them. Public hangings without trial – the only offense being that the victims were Armenians – were taking place constantly. The [soldiers] showed a particular desire to annihilate the educated and the influential… I was constantly receiving reports… [of Armenian men marched to a] secluded valley, a mob of Turkish peasants fell upon them with clubs, hammers, axes, scythes, spades, and saws. A guard of [soldiers] accompanied each convoy… From thousands of Armenian cities and villages these despairing caravans now set forth; they filled all the roads leading southward… When the caravans first started, the individuals bore some resemblance to human beings; in a few hours, however, the dust of the road plastered their faces and clothes, the mud caked their lower members, and the slowly advancing mobs, frequently bent with fatigue and crazed by the brutality of their “protectors,” resembled some new and strange animal species. Yet for the better part of six months, from April to October 1915, practically all the highways in Asia Minor were crowded with these unearthly bands of exiles. They could be seen winding in and out of every valley and climbing up the sides of nearly every mountain – moving on and on… every road led to death. Village after village and town after town was evacuated of its Armenian population… about 1,200,000 people started on this journey to the Syrian desert. Detachments of [soldiers] would go ahead, notifying the Kurdish tribes that their victims were approaching, and Turkish peasants were also informed that their long-waited opportunity had arrived. The Government even opened the prisons and set free the convicts… Thus every caravan had a continuous battle for existence… Turkish roughs would fall upon the women, leaving them sometimes dead from their experiences or sometimes ravingly insane. And thus, as the exiles moved, they left behind them another caravan – that of dead and unburied bodies, of old men and of women dying in the last stages of typhus, dysentery, and cholera, of little children lying on their backs and setting up their last piteous wails for food and water. The most terrible scenes took place at the rivers, especially the Euphrates. Sometimes, when crossing this stream, the gendarmes would push the women into the water, shooting all who attempted to save themselves by swimming. Frequently the women themselves would save their honor by jumping into the river, their children in their arms… In a loop of the river near Erzinghan… the thousands of dead bodies created such a barrage that the Euphrates changed its course for about a hundred yards. At another place, where there were wells, some women threw themselves into them… [and] were drowned and, in spite of that, the rest of the people drank from that well, the dead bodies still remaining there and polluting the water. In one particular death march… On the seventieth day a few creatures reached Aleppo. Out of the consigned convoy of 18,000 souls just 150 women and children reached the destination. A few of the rest… were still living as captives of the Kurds and Truks; all the rest were dead.